Our presentations are interesting, practical and humourous. We will make you laugh – at yourself – at us and with us. But, when we're done you will also understand that you “learned” while you “laughed”. Our presentations are fun, fast paced, dynamic, interactive and informative. 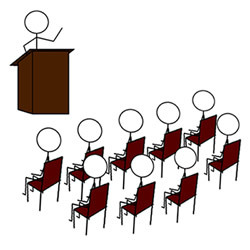 We will design and deliver a presentation to address any and all specific needs your group might have. These are some of our presentation topics. Please contact us for more details and/or outlines. Balancing – an Act or a Skill? Brenda is a speaker, trainer, writer and consultant. She is the founder and president of The Robcan Group. Her Bachelor of Arts was earned at Brandon University and her Masters of Education at Simon Fraser University. She has been addressing groups for over thirty years about communications, humour, laughter, positive working skills and wellness in general. Her workshops and presentations are in high demand. She has authored four books and created an Audio CD set to help people to develop these skills. Brenda grew up on a farm close to Minnedosa, Manitoba and continues to stay connected to her family there. She now lives in Sherwood Park, Alberta where she and her husband, Len have their training and development business. Brenda and Len have five children and nine grandchildren. Brenda believes that we are on a life-long learning journey. It should be enriching, exciting, interesting and above all, it should be fun! Jan is a speaker, trainer, and consultant with a passion for working with people to achieve workplace wellness. She has more than 25 years experience as a senior manager in the public sector, where she continues to lead a large and diverse team of people. Jan has been addressing groups for 10 years on topics related to Leadership, Team Building, Conflict Resolution and achieving life balance. It is Jan's belief that leaders must "walk the talk" and that successful leaders are those who embark on a journey of continuous learning. Jan grew up in Saskatoon, Saskatchewan. She now lives in St. Albert, Alberta with her husband John and their two teenage children. Jan enjoys travel, reading and down hill skiing. Jan can often be found cheering on her children in Hockey, Ringette and Lacrosse and she is an avid community volunteer. Jan received her Advanced Bachelor of Arts from the University of Saskatchewan with a double major in Psychology and English. Jan has continued her education by pursuing courses in Human Justice, Mediation and the Queen's University Public Executive Program. Join Jan to learn strategies to improve your workplace wellness, achieve work/life balance and stay positive through the use of humour.